This weekend I feel like I am in the mood for some comedy (NOTE: This will include Comedy-Horror as this is my last weekend of watching any type of horror till October). I also thought it would be fun to do something similar to the Movie serial chapters in between movies. But this time I decided to watch some theatrical shorts... so this weekend in between each movie I will watch a Comedy Short (Little Rascals & Three Stooges). I am posting this today to give people time to request any reviews they would like to see. I probably won't get to any movies today... but if I do get the chance I may watch one this evening. I have a load of comedies in my collection. There is no way I could list them all here... but what I will do is list a large portion here... leaving out any I may have recently watched or ones I just don't feel like I could get into this weekend. If there is any here that you would like to see reviewed please feel free to request it... and I will do my best at fitting it in at some point this weekend. Thanks Roger... I didn't realize it was a musical. You are right about it being part of that total movie set. Matter of fact all the unwatched ones are from the set. Which is why they are still unwatched. Though I have watched many movies from that set... and the quality ranges from awful to decent (well watchable anyway). You probably won't like The Pajama Game because I believe that is in actuality a musical. Not Roger! He's my buddy... he's got my back! It may not be a comedy Roger... The ones in bold are ones I never seen before... so never seen that one. And I was just going by the genres the program already had attached to it. It could be that they got the wrong genre attached to the profile. I will have to see. I haven't watched Runaway Bride in a long time. Not since I first got it back in 2003. I don't have Pretty Woman in my collection though... so can't watch that one. I really should add it... it was one of Dawn's favorites. I concur with Roger, you should watch His Girl Friday! If you like it, even only a bit, refer back to that list I posted when Karsten watched and was disappointed with Alex & Emma, or whatever it was. They're solid gold! Hildy Johnson has divorced Walter Burns and visits his office to tell him that she is engaged to another man and that they are going to get married the day after. Walter Burns can't let that happen and frames the other man, Bruce Baldwin, for a lot of stuff getting him into trouble all the time, while he tries to steer Hildy back into her old job as his employee as editor of his newspaper. Since I got a couple recommendations for this movie I thought I would start with it. This is a movie I never seen before. But the overview of it sounds like a good movie. I went into this one expecting a terrible quality DVD as this is part of that free 40 movies on 20 DVD classic boxset that Total movie gave away with subscriptions. And those movies range from terrible to watchable when it comes to quality. But in this case I would say it is of good quality. At least on my 20in standard TV. There was a few scenes with some scratches in the film. But that was the worst of it. 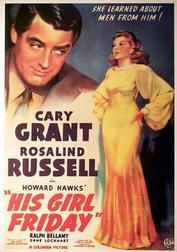 The movie stars Carey Grant and Rosalind Russell... and this is the only movie I have with either of them. I found that while he seemed to be a good actor... I found I didn't care much for Carey Grant. But I did like Rosalind Russell. I will have to see about getting some more movies with her in it. The movie itself I found I enjoyed quite a bit. I had to laugh at all the problems that Carey Grant's character caused. Though I will say I found the ending to be a bit contrived. It just didn't seem to me that she would forget about her fiancee so fast and back with Carey Grant's character the way they did it. It just seemed to go against her feelings through-out the entire movie before it. The Three Stooges face a potential bout with disaster when the wrestler they're supposed to watch over gets too drunk to fight. I remember when I was a kid my brothers and I used to watch quite a bit of Three Stooges. And even thought it has been many years I remembered portions of this short. Mostly of Curly in the ring in that long fake beard. I liked this one... but then I have always enjoyed the Curly years more then Shemp years. "Roberts and Gere confirm their status as an eternal screen team" in this delightful laugh-filled romantic comedy. Roberts plays small-town girl Maggie Carpenter, whose marches down the aisle become a series of near Mrs. when she bolts before saying "I do." Gere is Ike Graham, a cynical, big-city newspaper columnist eager to write a tell-all story about Maggie. But the more Ike finds out about skittish Maggie, the more he finds he's falling in love. This is one I haven't seen in many years. And it was better then I remembered it being. I really enjoyed it. There is a familiar face in this one. Laurie Metcalf (Jackie on Roseanne) The odd thing about that is that she has a rather large part... but wasn't credited in the movie credits. I think it is a fun storyline and both Julia Roberts and Richard Gere did a fine job in it. Glad you liked it! I think Cary Grant was marvellous, though I do prefer him slowed down. This was one of the true screwball comedies, which were designed to be performed at breakneck speed (hence the contrived feeling too). Bringing Up Baby is even faster, but I strongly recommend The Philadelphia Story with everyone including Grant at normal speed! I'd be interested in what you think of him there. Thanks Jon... and you know... I do believe that is the problem I had with Carey Grant. I will have to give a couple more a try and see what I think.